Riverside students, parents and administrators took to the State Capitol on Tuesday, Jan. 30 to meet with legislators and share a message of educational empowerment as a part of Decoding Dyslexia Virginia (DDVA) Advocacy Day 2018. Riverside, an independent, private day school, is dedicated to providing a teaching approach designed to meet the educational needs of students with dyslexia and similar language-based differences in kindergarten through eighth grade. The aim was to provide information and lobby on behalf of the oft-misunderstood learning dynamic called dyslexia, a mission that is at Riverside’s core. 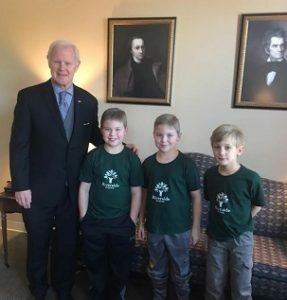 Members of the Riverside community and citizens alike visited legislators in their offices at the Pocahontas Building and educate them on dyslexia and its effects. The day also included story sharing and information distribution in order to direct public servants’ attention to the almost one in five Virginians that are affected by dyslexia. In addition to being on hand to provide materials and share student success stories with state representatives, the part of the goal was to ask legislators in decision-making roles to co-sponsor bills in support of education efforts that will affect dyslexic kids. One of the highlights of the day was being in the gallery during the Virginia House of Delegates’ Session where Riverside was recognized by Del. Dawn Adams. Mr. Speaker, I rise for an introduction … thank you, Mr. Speaker. Members of the Assembly, today in the gallery, I have the honor of introducing students, family members and teachers with Riverside School, located in Bon Air within the beautiful community of Chesterfield County, which I represent. Riverside School is a shining example of education at its best, providing individually-tailored instruction and support for children with dyslexia and language-based learning challenges. The children, parents and teachers are here as a part of Decoding Dyslexia Virginia Advocacy Day. It is estimated that nearly one in five Virginians are affected by dyslexia and it is the most common learning disability in the United States. Today, I’ve had the privilege of listening to these amazing students, ranging from third to sixth grade as they’ve discussed how the Orton-Gillingham approach to reading and learning at Riverside has unlocked their potential and changed their young lives for the better. Decoding Dyslexia Virginia, a grassroots movement focused on linking families to resources, support, and educational interventions for dyslexia, helped to organize and facilitate the effort. We aim to raise dyslexia awareness, empower families to support their children and inform policy-makers on best practices to identify, remediate and support students with dyslexia in Virginia. Riverside School is an independent day school located in Richmond, Va., dedicated to providing a teaching approach designed to meet the educational needs of students in grades K-8 with dyslexia and similar language-based differences. Small classes, individualized curriculum, one-on-one instruction, and a nurturing environment are all hallmarks of Riverside School. Please visit our website at www.riversideschool.org >>.